It was a long winter, and now’s the perfect time for spring cleaning—your eating habits. Spring is the season for fresh produce! 1. Clean out your pantry and fridge: Be mindful of the junk foods you keep in the house. Toss any foods that make you lose all control once you start eating them or food you eat out of convenience. 2. Choose Color: Eating a rainbow of fruits and veggies is a great way to load up on fiber, vitamins, and other rich nutrients and antioxidants. Try to incorporate 2-3 colors in snacks and meals. 3. 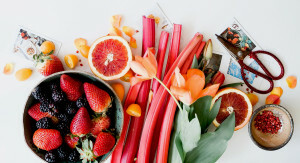 Limit Sugar: No need to cut all the sugar out of your diet but try replacing some sweetened drinks and snacks with healthier choices that are not full of added sweeteners. 4. Hydrate: All the cells and organs of the body need water to function properly. Dehydration can leave you feeling sluggish and can mask itself as hunger.